Dylan at Newport, 1965. Is there more to say about it? But today I’m digging the music. 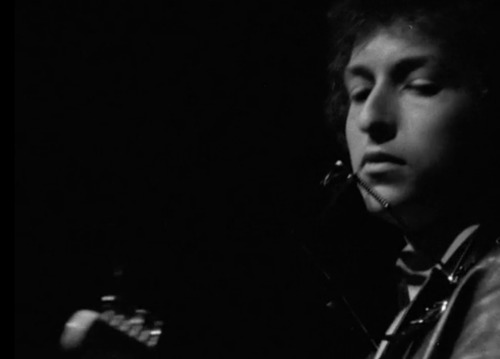 And I’m digging seeing Dylan along and with Michael Bloomfield on lead guitar, Al Kooper on organ, Barry Goldberg on piano, bassist Jerome Arnold and drummer Sam Lay, along with Barry Goldberg on piano, playing an amazing set. I really love this version of “Maggie’s Farm.” Michael Bloomfield sounds terrific. Absolutely outstanding! Thanks for posting! This needs to be seen every now and then. It’s so unbelievable to hear booing. It’s brilliant!